To prove how far it's willing to go to help you save, FirstBank encourages holiday spendthrifts to snap digital photos of its ads -- and repurpose them as presents. The idea's a lot funnier than it sounds. 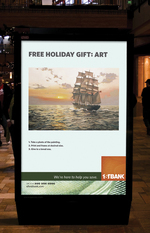 At left is an outdoor ad with a generic piece of art, which you can photograph, frame and pass on to unwitting (or undeserving) family members. Other cheapskate gifts include a star adoption certificate (which we're actually thinking of using) and a homemade jam label. Each ad ends with helpful steps for re-gifting, and the slogan, now imbued with a delectable tongue-in-cheek quality (so rare in banks! ): "We're here to help you save." St. Buffett would beam. The work -- by TDA ADVERTISING & DESIGN -- will appear in Colorado, California and Arizona. UPS did the "re-gifter" thing too this year. Instead of making its ads reusable, though, it took the social media approach: letting users pass on crappy gifts they received.